Describe a force field and calculate the strength of an electric field due to a point charge. Calculate the force exerted on a test charge by an electric field. Explain the relationship between electrical force (F) on a test charge and electrical field strength (E). Contact forces, such as between a baseball and a bat, are explained on the small scale by the interaction of the charges in atoms and molecules in close proximity. They interact through forces that include the Coulomb force. Action at a distance is a force between objects that are not close enough for their atoms to “touch.” That is, they are separated by more than a few atomic diameters. For example, a charged rubber comb attracts neutral bits of paper from a distance via the Coulomb force. It is very useful to think of an object being surrounded in space by a force field. The force field carries the force to another object (called a test object) some distance away. A field is a way of conceptualizing and mapping the force that surrounds any object and acts on another object at a distance without apparent physical connection. For example, the gravitational field surrounding the earth (and all other masses) represents the gravitational force that would be experienced if another mass were placed at a given point within the field. In the same way, the Coulomb force field surrounding any charge extends throughout space. Using Coulomb’s law, , its magnitude is given by the equation , for a point charge (a particle having a charge ) acting on a test charge at a distance (see [link]). Both the magnitude and direction of the Coulomb force field depend on and the test charge . Figure 1. 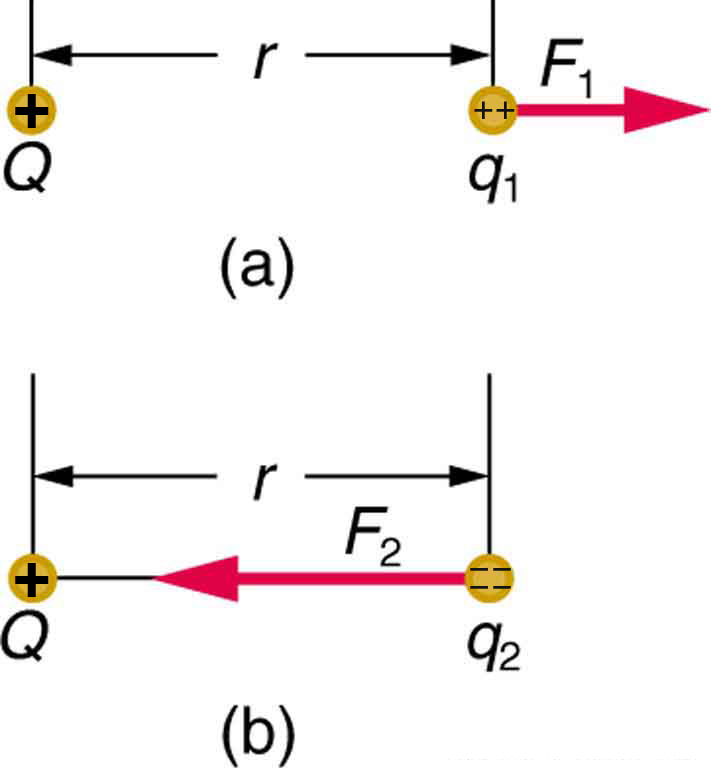 The Coulomb force field due to a positive charge Q is shown acting on two different charges. Both charges are the same distance from Q. (a) Since q1 is positive, the force F1 acting on it is repulsive. (b) The charge q2 is negative and greater in magnitude than q1, and so the force F2 acting on it is attractive and stronger than F1. The Coulomb force field is thus not unique at any point in space, because it depends on the test charges q1 and q2 as well as the charge Q. The electric field is thus seen to depend only on the charge and the distance ; it is completely independent of the test charge . Calculate the strength and direction of the electric field due to a point charge of 2.00 nC (nano-Coulombs) at a distance of 5.00 mm from the charge. We can find the electric field created by a point charge by using the equation . This electric field strength is the same at any point 5.00 mm away from the charge that creates the field. It is positive, meaning that it has a direction pointing away from the charge . What force does the electric field found in the previous example exert on a point charge of ? Since we know the electric field strength and the charge in the field, the force on that charge can be calculated using the definition of electric field rearranged to . Because is negative, the force is directed opposite to the direction of the field. The force is attractive, as expected for unlike charges. (The field was created by a positive charge and here acts on a negative charge.) The charges in this example are typical of common static electricity, and the modest attractive force obtained is similar to forces experienced in static cling and similar situations. Play ball! Add charges to the Field of Dreams and see how they react to the electric field. Turn on a background electric field and adjust the direction and magnitude. The electrostatic force field surrounding a charged object extends out into space in all directions. The electrostatic force exerted by a point charge on a test charge at a distance depends on the charge of both charges, as well as the distance between the two. where is the Coulomb or electrostatic force exerted on a small positive test charge . has units of N/C. where is the distance from . The electric field is a vector and fields due to multiple charges add like vectors. 1: Why must the test charge in the definition of the electric field be vanishingly small? 2: Are the direction and magnitude of the Coulomb force unique at a given point in space? What about the electric field? 1: What is the magnitude and direction of an electric field that exerts a upward force on a charge? 2: What is the magnitude and direction of the force exerted on a charge by a 250 N/C electric field that points due east? 3: Calculate the magnitude of the electric field 2.00 m from a point charge of 5.00 mC (such as found on the terminal of a Van de Graaff). 4: (a) What magnitude point charge creates a 10,000 N/C electric field at a distance of 0.250 m? (b) How large is the field at 10.0 m? 5: Calculate the initial (from rest) acceleration of a proton in a electric field (such as created by a research Van de Graaff). Explicitly show how you follow the steps in the Problem-Solving Strategy for electrostatics. 6: (a) Find the direction and magnitude of an electric field that exerts a westward force on an electron. (b) What magnitude and direction force does this field exert on a proton? 18.4 Electric Field: Concept of a Field Revisited by OpenStax is licensed under a Creative Commons Attribution 4.0 International License, except where otherwise noted.